UltraWide QHD resolution and thirty-four inches of curved 21:9 aspect ratio widescreen give you a truly panoramic view. Adaptive-Sync technology offers stutter-free and tear-free gaming and DTSÂ® Sound speakers amp up the audio. Easy adjustments and special picture modes allow you to fully customise your viewing experience. Plenty of curved screen real estate and a cinematic 21:9 aspect ratio make sure games and movies look as epic as possible. 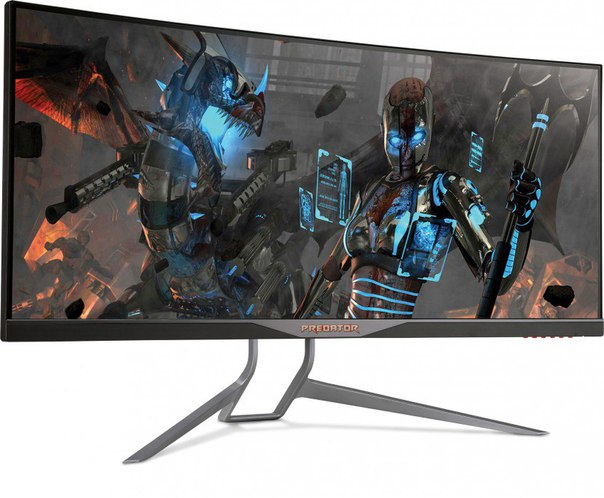 This monitor sports a curved UltraWide QHD display with ColorPlus technology, including 100% sRGB gamut and 6-axis color adjustment for a perfect picture. IPS technology lets you see clearly from nearly any angle. Say â€œgoodbyeâ€ to stuttering and tearing. Adaptive-Sync technology matches the refresh rate of your monitor with your graphics card to provide the smoothest gaming experience. Get into games with two built-in 7W DTSÂ® Sound speakers. World-class audio is coming to your movies, games, and music. Picture-in-Picture and Picture-by-Picture display modes let you fully customise your display. Drive the XR Series along with other monitors in a daisy-chain configuration using only one video output. Achieve ultimate gaming luxury with dynamic angles, cool ambient lighting, and a futuristic aluminum base. Your desk has never looked this good. Stay in the fight for hours with EyeProtectâ€™s Flicker-less and Blue-light Filtering technology. Give your neck a break too, with very flexible tilt and height adjustments.